Overflowing with blueberries? 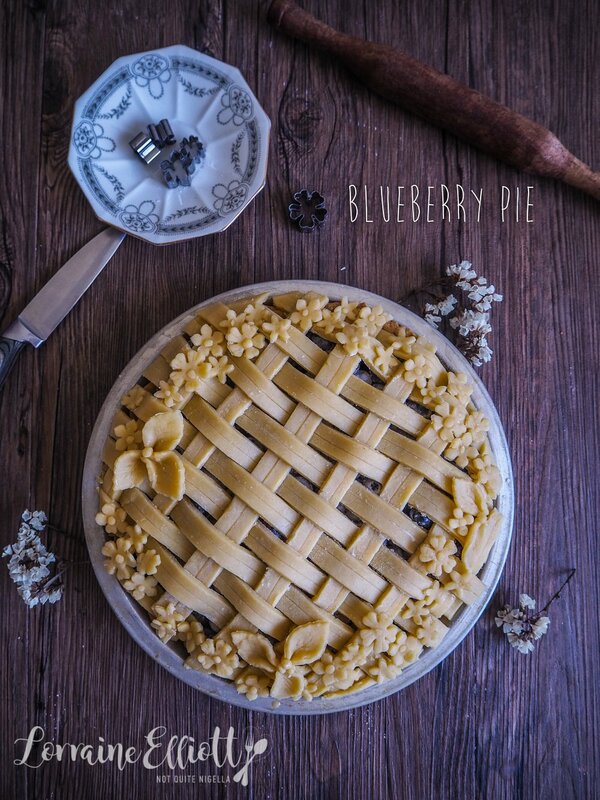 They're abundantly in season at the moment and at such prices that you can easily make them into a delicious blueberry pie. 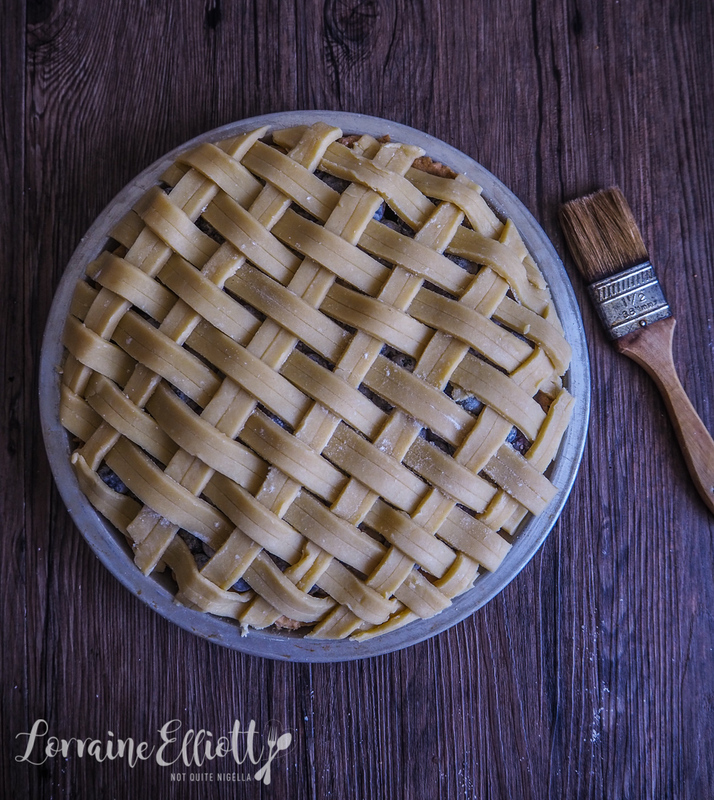 But because you know I can't leave well enough alone, this one has a basket weave crust, flowers and leaves on top and I show you how to achieve this fancy crust-it's easier than one might think! Dear Reader, this is one of my favourite pies ever. I can now see why blueberry pie is so popular in America and it's a shame that blueberries are always so expensive so that we can't have this regularly (conversely, I was surprised to see huge punnets of blueberries for sale in America and Canada for an absolute steal and wanted to do an apron and bake a pie straight away). Although the crust looks complicated I promise you that it isn't-stay with me on this my dears. Your best friend to achieve this effect is a ruler as well a sharp knife and flower cutters. Also save this for a day where it isn't too hot. 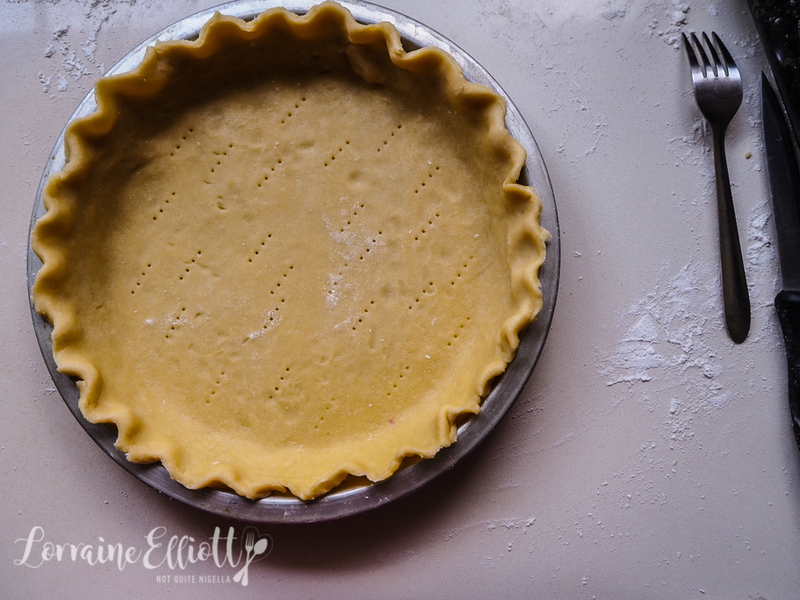 The other key is this specific pastry recipe that is my go-to crust recipe. Not only does it taste wonderful but it is a dream to work with as it rolls and rerolls easily. My advice is that for an intricate crust stay away from shortening based shortcrust pastry recipes as they have a wonderful texture once baked but are too soft to hold up to this sort of pattern. Having said that, I was surprised at how easily this came together. 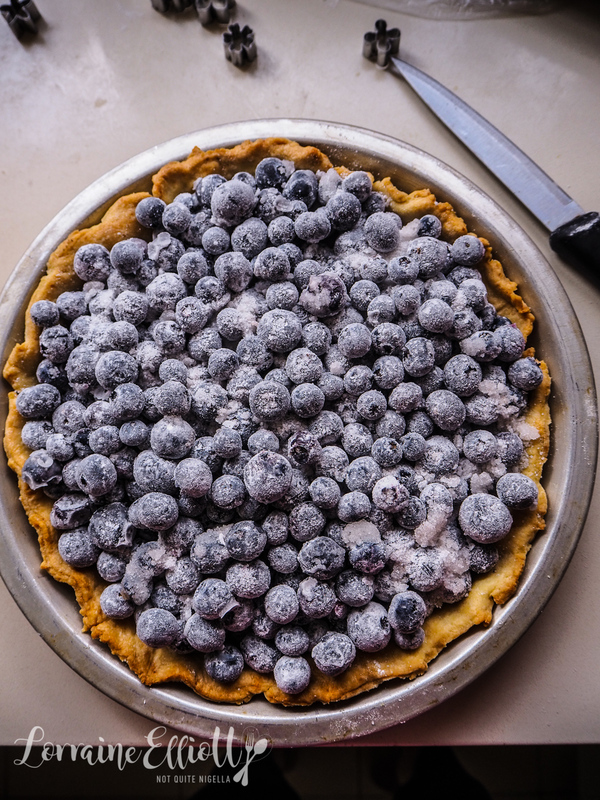 It also helped that the layer of blueberries were frozen making sure that the pastry stayed chilled. Keeping it cool is always the key to pastry making. The resulting pie was so good Mr NQN ate three slices and I ate two slices of it before coming out of my pastry fugue state, corners of my mouth stained purple from the berries. It was a dream pie. Speaking of dreams, I had a dream the other night that Mr NQN was having an affair. A bit of background: I had just met up with a friend of mine whose husband had left her because he was having an affair with his assistant (a total nightmare cliche come true) and she told me that a lot of her friends had come out to support her as their husbands had also been having affairs. Which got me to thinking, "Geez is everyone having affairs?". This must have permeated my dreams because that night I had a dream that he was having an affair with a friend of mine. I woke up startled at 4am and looked over at him asleep. It was probably too early to wake him just to tell him my dream (although I did consider it for a brief moment) so I wrote some notes in my phone and then went back to sleep. The next morning he woke up and I was staring at him. "I had a dream you were having an affair," I said to him in an accusing tone. "Err what?" he said sleepily. I blurted out the dream to him although admittedly with the passing of time and application of logic it made very little sense. "And then I ran around the whole car park trying to find you two because I could see you both in the pool but then you weren't there in the pool in the car park!" I concluded, slightly lamely because once I described the dream it made literally no sense whatsoever. "Okaaay," he said looking at me like I was an alien but not wanting to agitate me further. And fired up, I leaned over and smacked him on the bottom. "And that's for having an affair!" I said. "But it was a dreaaam!" he said half laughing half rolling his eyes, used to my madness. Once I calmed down, I felt a bit bad about projecting my dream onto him. So I decided to make him a pie. 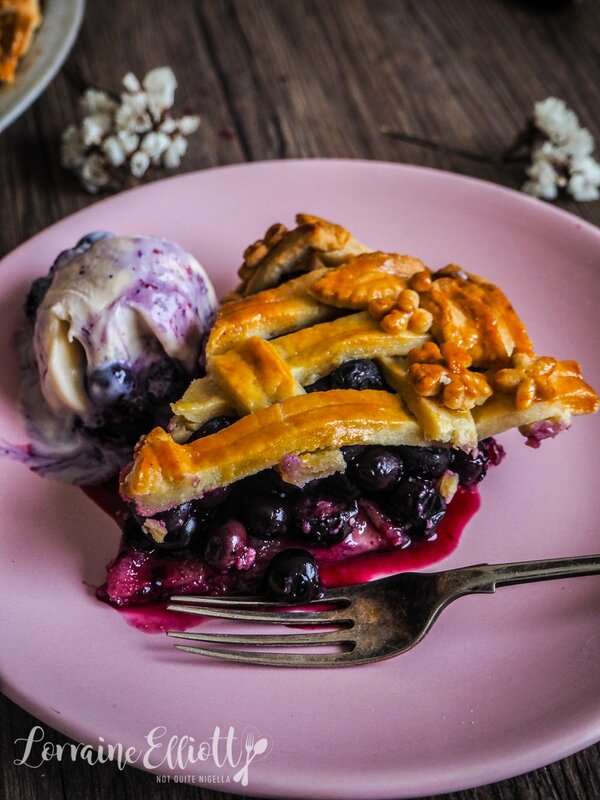 This blueberry pie actually. You've probably seen blueberries on sale at a ludicrously cheap price lately too. Usually they can be $5 a punnet but lately we've seen them for $1.25 so we bought over a kilo of them and froze them. Out they came for this pie. 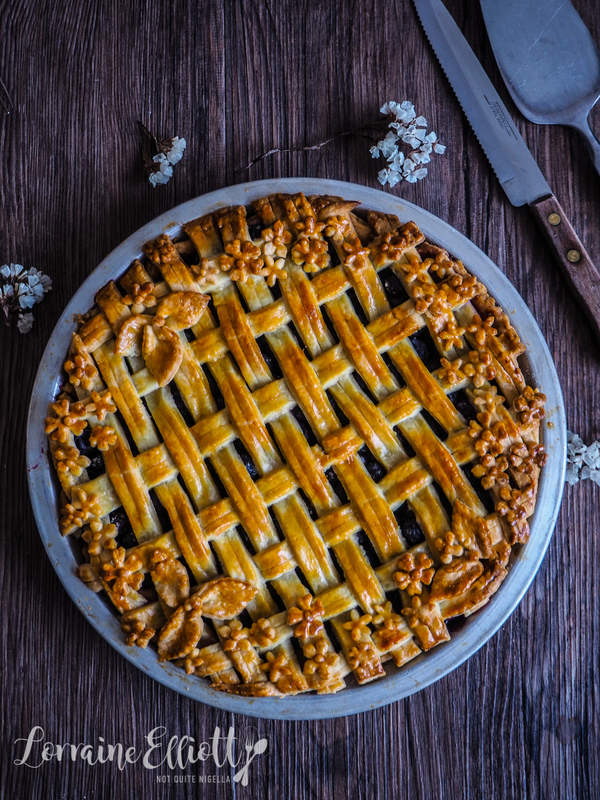 I usually tinker around with recipes but in this case I wanted a classic blueberry pie. But you know me, it has to be different in some sort of way. Usually Mr NQN is all about the fruit filling and I'm more about the pastry and we usually just share a piece and eat our favourite bits. But this was too good to only eat one part. The blueberries have a wonderful level of jammy sweetness without being too sweet and the pastry is an absolute dream. Even with the elaborate crust he ate the entire thing! 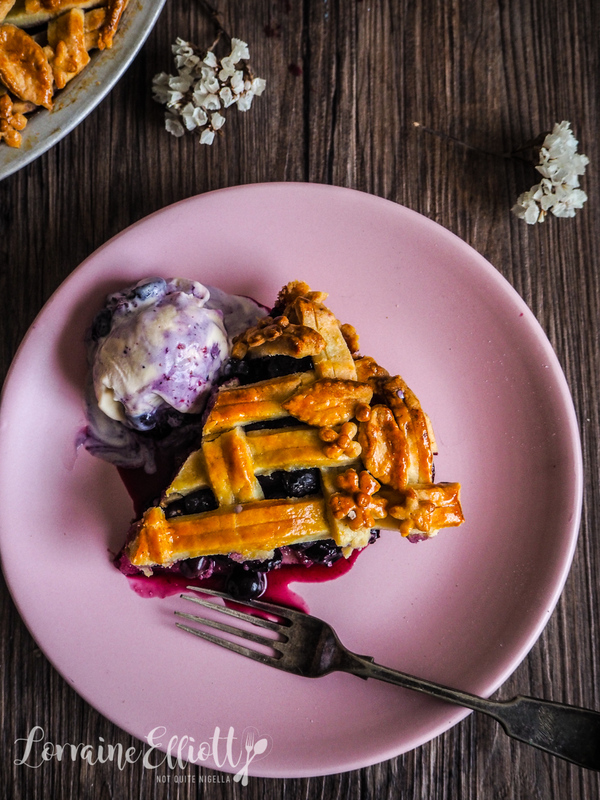 And if I'm likely to have a dream, it's probably about this blueberry pie! So tell me Dear Reader, do you remember your dreams? Have you ever gotten upset with someone because of a dream? 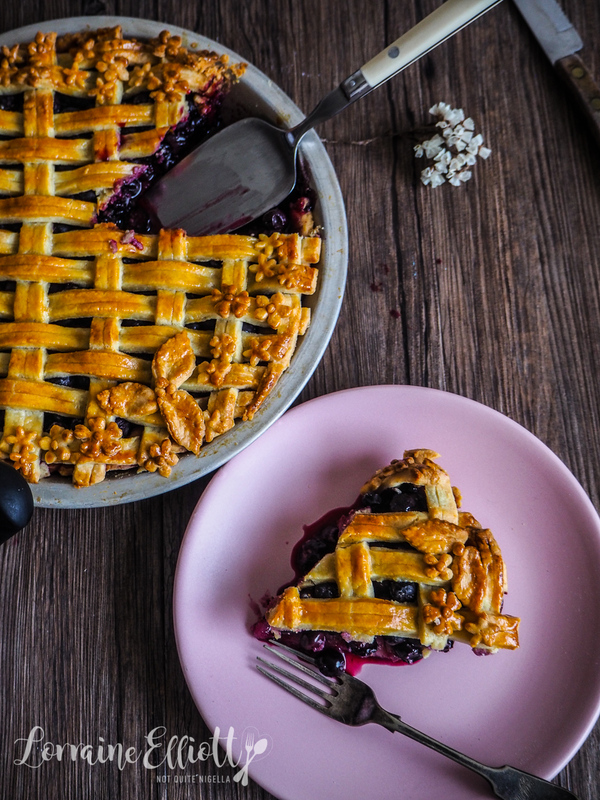 Have you made a blueberry pie and what is your favourite pie filling be it sweet or savoury? 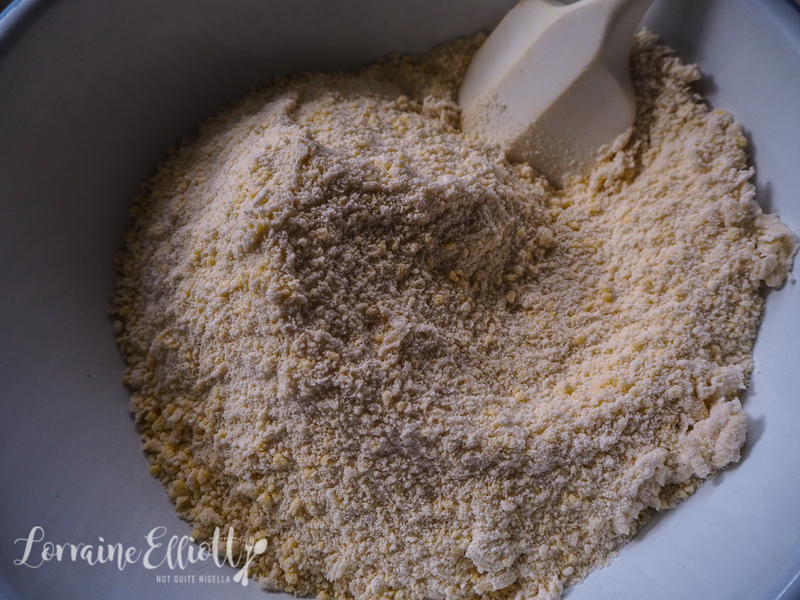 Step 1 - Place the flour, sugar and salt in a food processor and process until mixed. Add butter cubes and process until you get a sand like texture. Add 6-7 tablespoons of ice water and pulse until just combined-add an extra tablespoon of water if you need it but try to avoid it becoming too wet. 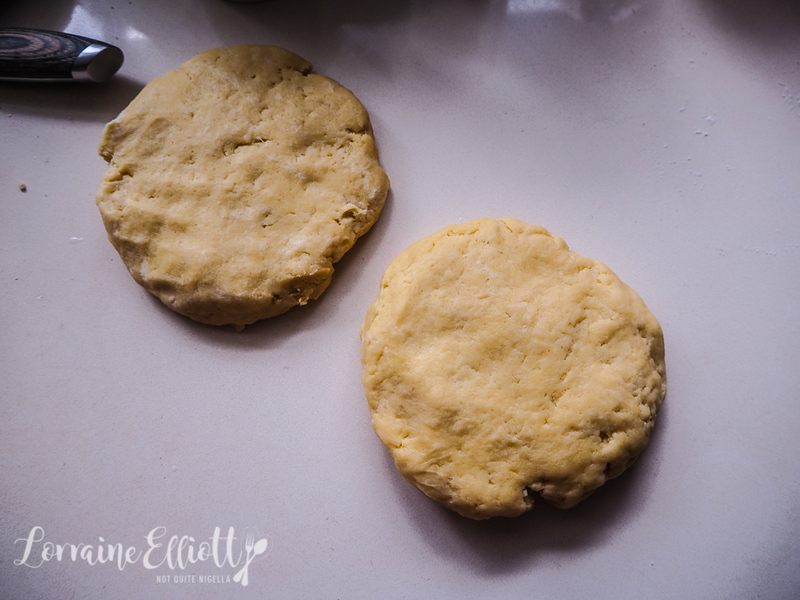 Step 2 - Knead until even textured, divide into two pieces and cover with cling film and refrigerate for 1 hour. Step 3 - Mix the blueberries, sugar, cornflour, lemon zest and cinnamon. Set aside until ready. Step 4 - Roll out one round of pastry on a lightly floured surface (I leave it on the bench for 5 minutes if it is too stiff from the fridge). 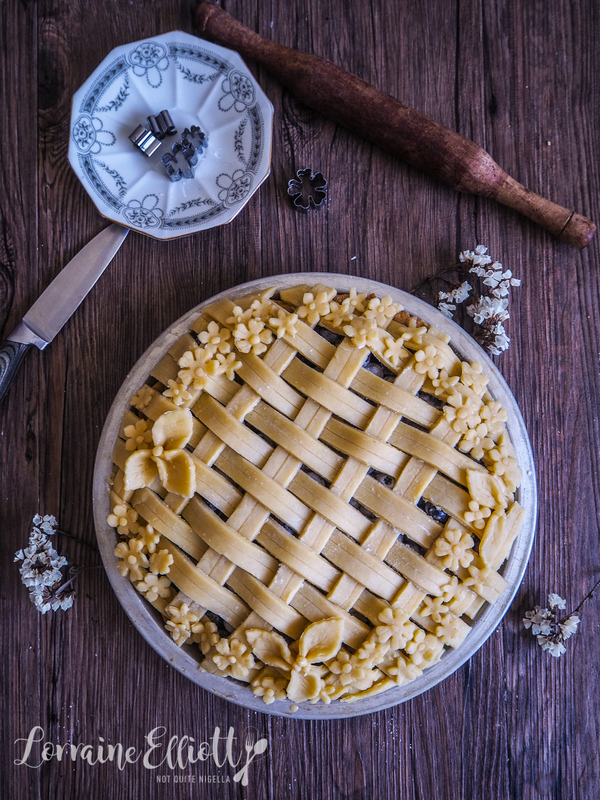 Place in a pie tin and flute the sides and dock the base with a fork. Place in the fridge for 30 minutes. Preheat oven to 200C/400F. 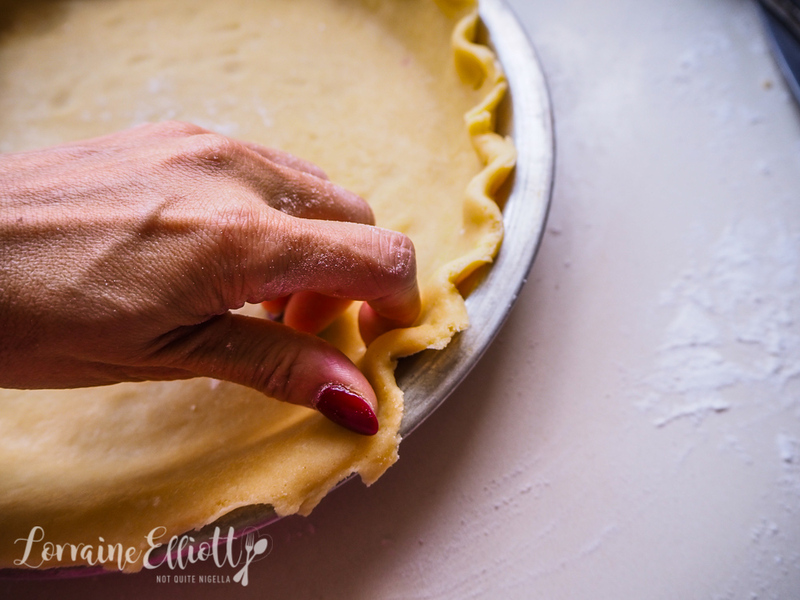 Line with a sheet of foil (spray the foil with oil on the side that touches the pastry) and fill with pie weights and bake for 20 minutes. Remove the foil and bake for another 5 minutes. Cool. 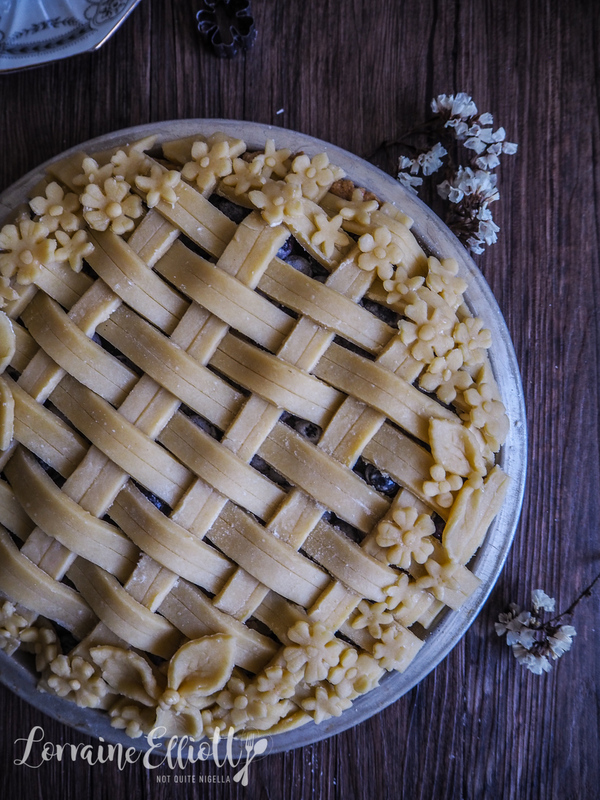 Step 5 - Place the filling inside the pie and refrigerate. 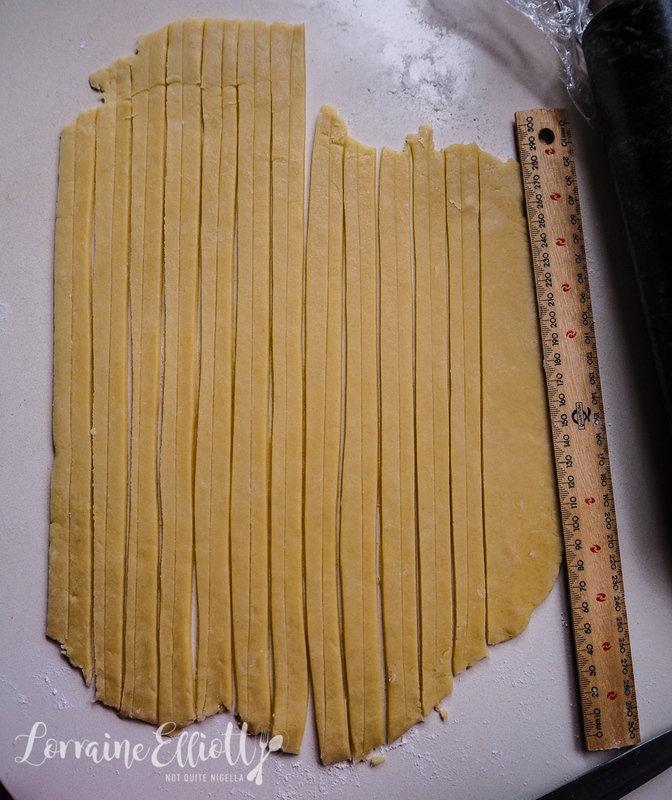 Roll out the remaining disc of pastry and cut into 1.5cm strips. 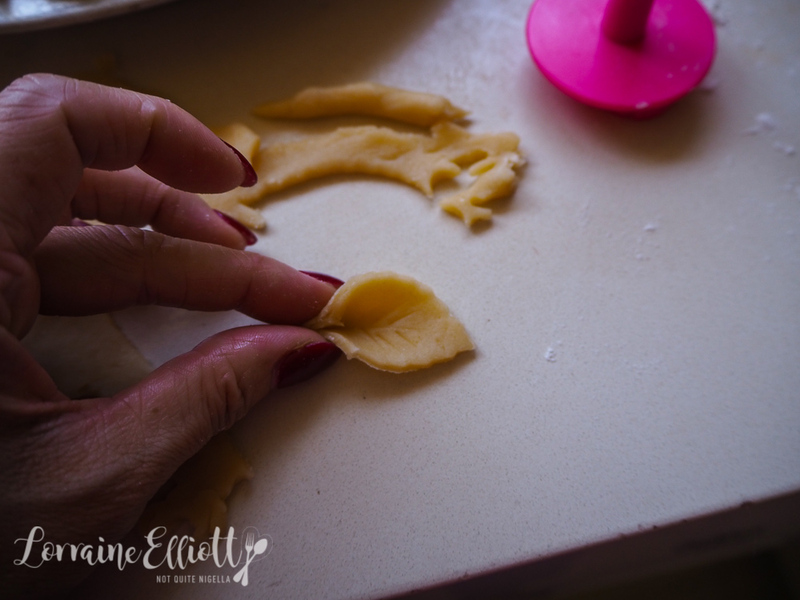 With a butter knife, make a mark down the centre but don't cut all the way through and then place in the fridge for 10 minutes. Then make a lattice top - lay down strips keeping them close and then place other strips in the opposite direction lifting up alternate strips (see this post on how to achieve the lattice pattern). Place in the fridge for 15 minutes while you cut out the flowers and leaves. 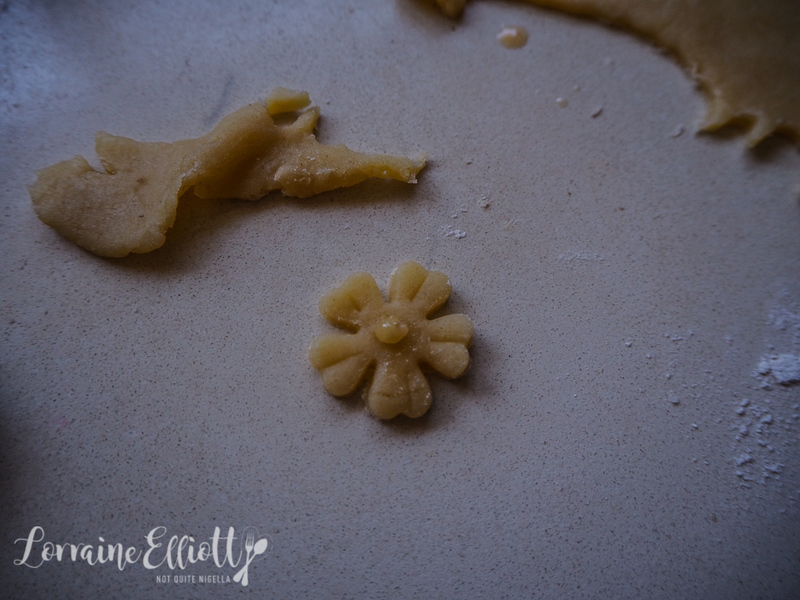 Step 6 - Cut out the remaining pastry in flowers and leaves. Brush the whole pie top with the egg yolk and adhere the flowers using the egg yolk and then brush these with yolk too. Bake at 190C/380F oven for 50-60 minutes or until the blueberry filling bubbles. I also place a tray at the bottom of the oven to catch any overflow of filling to make it easier to clean it up. recipeA Berry Special Mulberry & Pinot Noir Pie!